Dagnabbit, Norman’s got the correct diagnosis, but the wrong prescription. There is an inequality that’s baked into the pay structure for players—the NFL is a have and have-not league, with a shrinking middle class, and that disparity undoubtedly keeps getting worse. Obviously, some of this is unavoidable, and not necessarily a bad thing, since superstars will never be paid the same as the grunts at the bottom of the roster, nor should they be. But the NFL is a league in which all restrictions on market forces already work to benefit ownership. Another artificial, arbitrary limitation on player earnings and negotiating ability sure as hell isn’t the answer. Norman has certainly caught on to the trend. The top 18 contracts in terms of average annual value (AAV) all belong to quarterbacks. 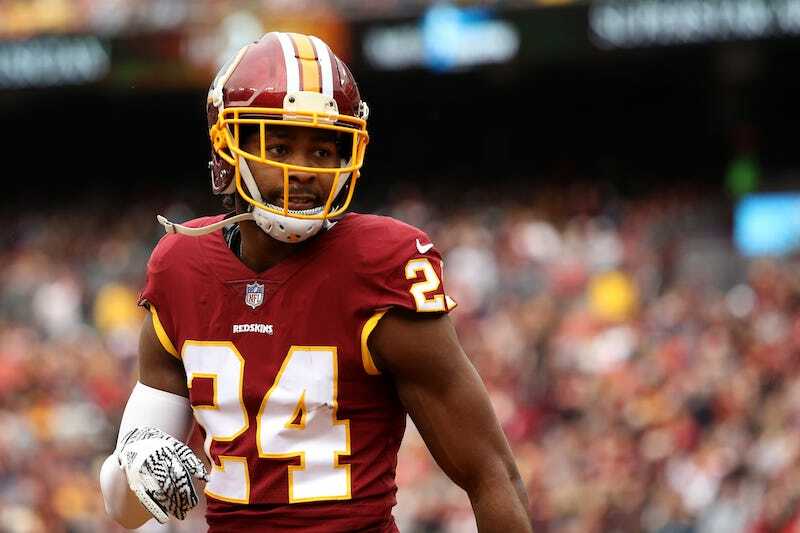 The top eight names on that list—Matt Ryan, Kirk Cousins, Jimmy Garoppolo, Matt Stafford, Derek Carr, Drew Brees, Andrew Luck, Alex Smith, in that order—all signed their deals after April 2016, when Norman became the league’s highest paid cornerback ($15 million AAV). Likewise, no non-QB makes more than Broncos edge defender Von Miller ($19.083 million AAV), and Miller signed his deal in July 2016. This remains true even as the salary cap (which is tied directly to league revenues) has jumped 14 percent since 2016, and even as non-QB stars like Khalil Mack, Aaron Donald, Le’Veon Bell, and Odell Beckham Jr. can’t come to terms on new contracts. Additionally, the extension Ryan signed with the Falcons back in May will pay him $94.5 million fully guaranteed. Yet the threshold for guaranteed money for non-QBs ($59.955 million) was set by then-Dolphins defensive tackle Ndamukong Suh way back in March 2015, and since then no one’s come close: Jaguars defensive tackle Marcell Dareus got $42.9 million in September 2015, when he was with the Bills; and Darrelle Revis’s standard of $39 million in full guarantees for cornerbacks also dates to March 2015. That the NFL places such outsized value on quarterbacks ought to come as no surprise, given the dearth of good ones out there. But you know the scale is completely is out of whack when Matt Schaub has higher career earnings than any current player who toils in the defensive secondary, as Clark noted. In many ways, however, this is by design. The league’s longstanding history of structuring contracts based on a strict reading of positional value has forever served as a kind of soft collusion. The collective bargaining agreement, which went into effect in 2011 and runs through the 2020 season, has codified a system that ownership has used to divide the players against themselves. Mechanisms like injury splits, per-game roster bonuses, automatic voids, and voidable guarantees for drafted rookies all work in concert with the rookie wage scale, the franchise tag, and restricted free agency to create this chasm. It’s exactly the sort of division that can threaten player unity—a tenuous project to begin with—when it comes time to bargain for the next CBA. There’s more, of course. This CBA, which only grants players a minimum of 47.5 percent of revenues, has a rollover allowance that lets teams squirrel away cap space by requiring them to spend 89 percent of their total cap across four-season intervals, rather than year to year. And once you throw in the notorious “fully funded rule” for salary guarantees, you can see the entire foundation of a system that’s built to keep labor costs in check. At center stage for all this is the hard salary cap. That hard cap represents a much better target for players to take aim at. The Ringer’s Clark asked Norman a question like the one he asked Packers quarterback Aaron Rodgers, whose next contract has all sorts of potential for trend-setting. Rodgers answered by offering up suggestions like a luxury tax for teams that might want to spend beyond the cap, or an NBA-style mid-level exception. Norman, too, spitballed the idea of guaranteeing the top five salaries on each team. These are more sensible solutions, in that they create opportunities for players to bargain their way around that hard cap. The CBA is already heavily skewed against them. The last thing players need is to be doing the owners’ work for them.